Throughout history, churches and cathedrals have always been a huge inspiration for many styles of art, crafts and trades. Their elegant structure, the wooden interior, the breathtaking stained glass windows all seem to have a strong impression on so many. It is always wonderful when we are able to take with us some of the emotions, memories and ideas and use them in our daily life and home. 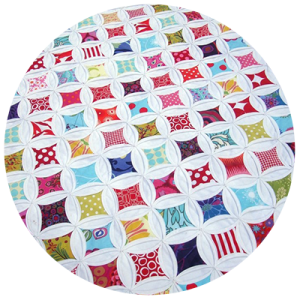 Cathedral window quilts are one of the beautiful quilt styles we can make which capture the inspiration of a beautiful church window and allow us to have a little part of a cathedral in our homes. 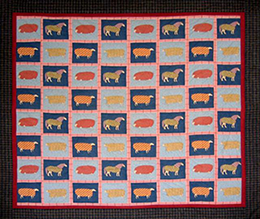 A cathedral window quilt is not the same as a traditional quilt. It earns its title from not including the backing or batting, and consists basically of the patchwork top with edging. Window panes are traditionally made from muslin or cheesecloth to create the translucent and light look generated from windows. The window frames are often made from heavier cottons or calicos. In the old days colors were used infrequently, however we now have an abundance of materials that can be used with translucence qualities, such as silks, organza (although I wouldn’t recommend using it), light cottons and many more. 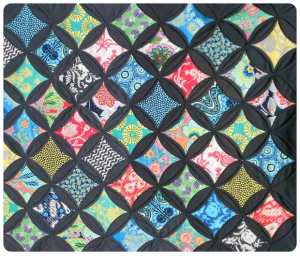 A cathedral window quilt is quite simple to make as it is customary that there is no quilting process, just patch-working. These days you simply iron down your edges and sew. 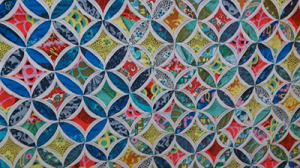 However, I have seen a number of cathedral window quilts which have a thin layer of batting and a backing sheet. I am guessing that these quilters wanted to use them for warmth as well as looking bright and beautiful as displays on their beds! See the cathedral window quilt patterns section for help making your own cathedral window quilt.